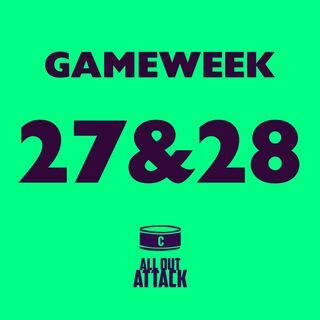 Two Gameweeks in quick succession is what we like here at All Out Attack - whether you’re stressing about Man City and Chelsea’s blank Gameweek or whether Man United and Liverpool are just going to cancel one another out, we’ve got few tips and differentials to help you out. The boys put in a late night recording session to make sure they could help prep your FPL team for two very quick Gamweeks. The lads spoke about the possibility of captaining a Wolves player for two straight fixtures, ... See More big players playing the occasion and the possibility of using your free hit for this upcoming blank game week. Nathan shows his love for Jimenez, Joe highlights his fears for Chelsea and they also discuss whether or not Jamie Vardy is a one to watch. Thank you, enjoy and as always good luck in Gameweek 27 and 28!